One of my friends from the Midwest, after looking at all the photos, said “Do they sell snowshovels in DC?” My response was “This is shoveled.” The plows and the shovels and snowblowers are hard at work out there, but the sheer amount of the white stuff is just not something you can easily cope with. As we walked back from brunch today (thank you again, Boulevard Woodgrill! 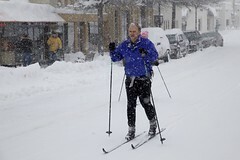 ), we caught a couple cross-country skiing up Wilson Boulevard. They said the skiing was pretty good! I figure they were bound for Ballston & beyond. So, if you have cross-country skis, and are up for a workout, today’s the day for it. Get on your skis! I saw two dudes on X country skis going up and down Mass Ave. at around 2pm. Looked like a lot of fun.